400 CE. The Anonymous Herbal Written by a Roman African and Copied by Hand for Over 1000 years. The Singularity of the Printing Press. 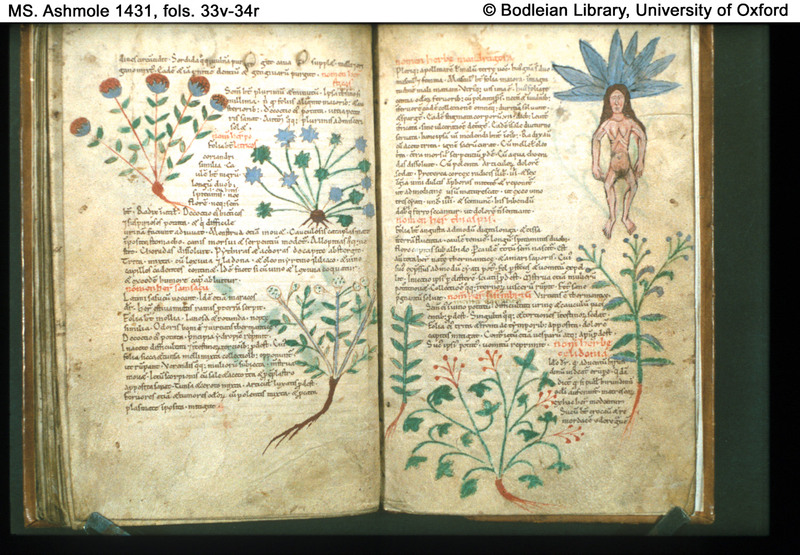 Prior to the invention of the printing press, herbal manuscripts were reproduced by being copied, written, drawn and bound by an individual's hand. There were rare, expensive and valuable items; each one at least a little bit, unique. The printing press changed all of this. It was a new industry, creating a new world and ushering in new possibilities. In every field of endeavour the relative ease of printing meant that existing manuscripts along with bright-new works could suddenly be mass produced, expanding the accessibility to knowledge to more and more people. The new masters of the art: the printmakers, were quick to realise its potential. The Herbarium of Apuleius Platonicus. One of the first herbals of these 'new born' books to be given the 'mass-production' treatment was a small volume known as the Herbarium of Apuleius Platonicus. This was effectively a popular 'everyman's' version of Dioscorides' master tome. The original author is unknown, the name 'Apuleius Platonicus' being only a pseudonym, though some evidence points to the author being a writer from (what is now) Algeria, in Roman Africa called Lucius Apuleius. The herbal does also contain a number of herbs found in Northern Africa, but no one really knows for sure. Copied by Hand for over 1000 years. The content of the early hand written manuscript was drawn (ie copied) primarily from Dioscorides and Pliny and so popular was this herbal that, if it did indeed first appear in the 5th century, and was first printed in the 15th century, then it would have been in continual production, through being copied by hand, for over 1000 years by the time it was first printed. It was one of the first, if not the first, translations of the Mediterranean herbal tradition into English and was around at the time of the Leechbook we have already looked at. When printed in the 15th century, it also became one of the first illustrated printed herbals, though the illustrations, being copies of copies of copies, were more 'artistic' than 'botanical'. A copy of an English translation exists today in the British Library. It of course mentions Arum, as Dracunculus, giving much the same information as Dioscorides.